Sada je: 19 tra 2019, 23:52. U ovu temu su prebačeni postovi koje su članovi foruma objavljivali vezano za Ubuntu Phone. Ako sam koji post krivo prebacio (jer ih je bilo puno), preskočio ili krivo premjestio, slobodno me kontaktirajte na PP pa ćemo ispraviti. 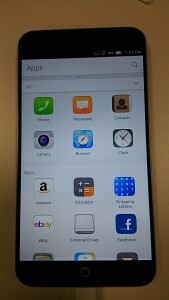 Ubuntu Touch na Meizu MX4 mobitelu. Another week, another Ubuntu Tablet news item... This time there's an unheard of company that's looking to deliver an Ubuntu Tablet inspired by Canonical's failed Ubuntu Edge smartphone. Inspired by the Ubuntu Edge smartphone that ultimately failed in its crowdfunding campaign, a company known as MJ Technology is looking to deliver the Edge's equivalent in tablet form. MJ Technology is looking to have Ubuntu Tablets in 8.9 and 10.1 inch models. The initial Ubuntu Tablet from MJ is expected to have a 2.4GHz Intel quad-core CPU, 4GB of DDR3 memory, 64GB of internal storage, microSD slot, two standard USB 2.0 ports, HD IPS display, 5GHz WiFi, Bluetooth 4.0, HDMI out, and will weigh under 1.5lbs. Mark Jun, the CEO of MJ Technology, contacted Phoronix to share this information today on this "Ubuntu Tablet comparable to Ubuntu Edge." The company will have out more information on the tablet around the time of the Consumer Electronics Show (CES) in January. Review samples will be out in about one month. Nekako prije mislim da će prvi tablet izdati BQ ili tako netko nego ovi nepoznati ali tko zna. BQ Ubuntu Touch mobitel navodno izlazi u veljači 2015 g.
Netko je pitao o tome na zadnjem Ubuntu On Air sessionu i ljudi iz Canonicala su to potvrdili iako neslužbeno. Vjerovatno će biti službena objava kada se bude znao točan datum, nadam se dostupnosti u cijeloj Europi jer BQ trenutno ne šalje baš u sve zemlje Europe ali ovaj model će vjerovatno slati. Zanima me hoće li išta mijenjati u vezi kućišta, staviti Ubuntu logo na primjer i što će napraviti sa navigation keys koje ne trebaju Ubuntuu jer je sve preko swipeanja. Ali vidjeti ćemo relativno uskoro. Bilo bi odlično da jednom izađe Ubuntu mobitel sa Ambiance bojama, baš bi se lijepo isticao u moru ostalih mobitela jednoličnih boja. Datum izlaska BQ mobitela je čini se 6.veljače 2015 g.
Canonical now has X.Org/X11 applications running on the Ubuntu Phone/Touch via XMir. While XMir has been around for a while to run legacy X applications atop Mir and has been tested countless times from the desktop, it seems the functionality is finally getting there for running X apps on Ubuntu phones. With Ubuntu Touch/Phone running Unity 8 on Mir and there being the GTK and Qt back-ends that interface with Mir directly, Ubuntu Phone apps don't have any need for X11 and other GTK/Qt apps don't as long as the programs don't make any X11 specific calls, but sadly there still are many apps with these X dependencies, hence porting to Wayland and Mir can still be a chore. LibreOffice is one of the applications that still depends on an X.Org Server but now thanks to XMir it can be run from the Ubuntu Phone.Will Cooke, the Ubuntu Desktop Engineering Manager at Canonical, posted to his Google+ page today about the progress in running X apps on Ubuntu Phone. He shared the photos shown in this article and wrote, "X.org applications running on a phone. For teh lulz." This work can be found in the Ubuntu 15.04 archive. Ubuntu Touch može vrtiti X aplikacije preko XMira. The first Ubuntu Phone will ship with a couple of default scopes not yet available in the “developer preview” builds one can download and shove on a Nexus phone. These default scopes are packed with content from a diverse range of sources, but all under an overarching theme. Let’s take a quick look at some of these in turn. The Today scope does what it says on the digital tin: it shows important and timely information on one screen, things like weather, your favourite contacts and any upcoming calendar appointments. The Nearby scope surfaces content based on location, with information from the likes of Yelp, TimeOut and others helping you find somewhere to eat or plan something to do. Other default scopes are more familiar in what they offer (and have been available in various guises in developer previews). The News scope combines news feeds from ‘chosen providers’ including the BBC, EuroNews and technology site Engadget. Categories let you drill down to find more specific items and personalise the scope so that it only shows you the stuff you’re interested in (e.g., you can add our feed ). The Music scope lets you browse music on your phone, the web, and online stores like 7Digital from one hub. Initial streaming content providers include SoundCloud and Grooveshark. The Photo scope combines images from Facebook, Instagram and Flickr so you can keep up with your social network buddies. Lastly, but by no means least, the Video scope lets you sift through the latest cat videos from YouTube, mind-blowing talks from TED and hipster uploads to Vimeo. Depending on content providers yet to be announced, it wouldn’t surprise me to see movie purchases made available here, too. All sources within an Aggregator Scope expand to reveal additional content, interactive categories, preview widgets, file snippets, etc. The result is an app-like experience without the need for an app. Sources within aggregator scopes can also be “starred” to be made a default screen of their own, giving you all the categories, widgets, departments and search boxes so you can see, find and filter down to the information, snippets and previews you want to see. Nekoliko stvari o Aggregator Scopeovima na Ubuntu Touchu. Nadolazeći Meizu M1 Mini će se navodno nuditi u Ubuntu Touch, Android i YunOS verziji. Mobitel ima 5" 720p ekran i 13 mpx kameru dok su ostale karakteristike nepoznate. BQ Ubuntu mobitel postaje dostupan u flash prodajama u nadolazećim danima. Cijena 169.90 EUR.